Join KINK, Metro, the City of Portland Graffiti Abatement program, SOLVE and Lents for the Paint the Town Green clean up event on Saturday, June 1st from 9 am to 1 pm. We'll be cleaning up litter and graffiti in various SE NEIGHBORHOODS throughout the morning, and we're looking for volunteers to join us. You don't have to live in those neighborhoods to help clean them up! We'll provide the supplies along with snacks AND lunch; you provide the energy. 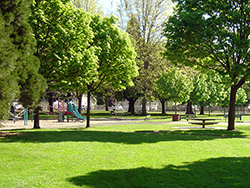 We will meet at Glenwood Park for breakfast snacks and a quick training, then start the clean up on 82nd toward Flavel. At the end of the clean-up, we will have lunch back at Glenwood Park. Sign up for Paint the Town Green today! Minors: Teens under 18 need to have waiver signed by an adult. just bring it with you. Qualifies for most public schools' Community Service Requirement . Team Leaders check in at 8:30 AM; volunteers check in at 9 AM. Pastries and snacks provided after short training and safety talk. We Need Team Leaders: Email marciaddy@outlook.com if you can help as a Team Leader. If you have participated in a SOLVE event before and are comfortable giving directions to people, you’re qualified. What to Wear and Bring: CleanUp will take place rain or shine. Check the weather forecast and dress accordingly. Open-toe shoes not recommended. All supplies needed to pick up litter and clean graffiti will be provided by SOLVE. Please bring a resuable water bottle if you can. Graffiti: If you want to focus on cleaning graffiti (painting over it or removing it with a safe citrus-based solvent) or removing stickers, we’ll give you the supplies, training, and help to remove it. Morning Snacks/Lunch: Water, pastries, and snacks (provided by Bella's Italian Bakery and New Seasons) at Glenwood Park, with lunch to follow (same location). Join us to share in food and conversation with surrounding neighborhoods to debrief about our experience and enjoy each other's company!